Cool & Dope is an amazing non-profit from Maryland and is using Tin Shingle’s resources to help them get the word out about their incredible mission - POSITIVITY! Giving kids of all ages to change the world, one positive vibe at a time. Action starts with us – yes, all of us! Sounds great, right! But here’s the thing, it was started by 6-year old, Cavanaugh Bell (Chief Positive Creator) while in kindergarten after he was bullied so badly, he wanted to die. He was so inspired by participating in the 2017 Women’s March in Washington, DC, that he wanted to make a difference in his community at home. But everywhere he went trying to volunteer with other organizations, he kept confronting the same obstacle. He was too young. TO VOLUNTEER! But that didn’t slow him down, he started an organization that allows kids as young as 2 years to participate in positive activities. Cool & Dope Is An Acronym! Cavanaugh begged his mom to start a nonprofit to spread more positivity and love in the world, which is and was his way of stopping bullies. To change them, and bring more happiness and contentment into their lives. By supporting a different cause each month, Cool & Dope is able to give parents a wide variety of kid-friendly philanthropic ideas to help make their local communities and the world a better (and much happier) place. Cavanaugh and Cool & Dope have already been seen on their local Washington DC area NBC, ABC and CBS Television stations. He also has been interviewed on Facebook by Dr. April Lisbon-Peoples and children’s author Tracy Blom about how to identify and prevent bullying. They are hoping to leverage their membership with Tin Shingle to get print coverage about the awesome work they are doing. The Ellen Show is their ultimate dream! Their pitch is already in Tin Shingle’s Pitch Whisperer forum, and we’re feedbacking on it now! Each month Cool & Dope focuses on different projects. Current and upcoming projects are “For the Love of Seniors” and in April – “Loving Our Planet.” Past projects have included “Holiday Love for the Homeless” and providing clean water for an entire senior living community in Flint, MI. Check them out at www.coolanddope.com and follow them on Instagram @cooldopeliving. Tin Shingle Member Blix Bike has been killing it with their Instagram. 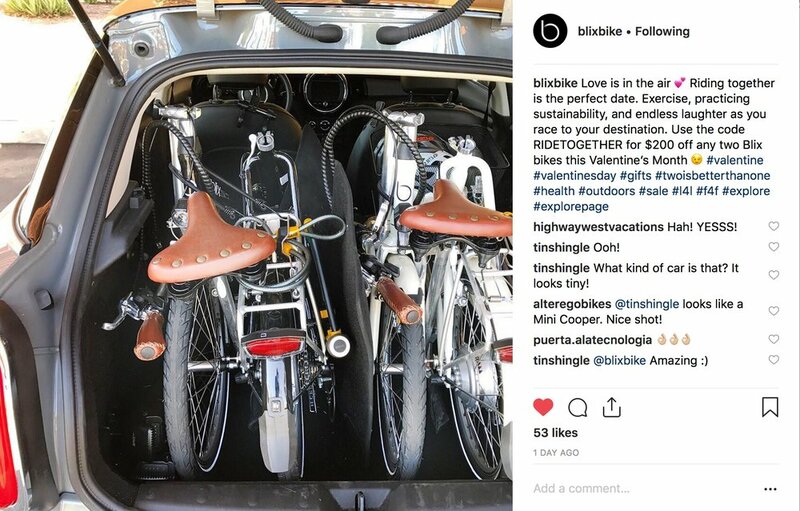 Though they sell a handful of products - a variety of models of ebikes and accessories like a basket and touch-up paint - their Instagram feed is always fresh and new. One way they do it is to show customer photos of how customers are enjoying the bikes. See how these two bikes fit into this mini car!